Let's kick it off with this PSA 8 1968 Topps Nolan Ryan Rookie card. One of the most iconic cards of the late 60's, here is Nolan Ryan along side Jerry Koosman as young guys about to change a city's outlook on a struggling Mets team. These don't come cheap, even in fair condition so it's no surprise that with this card ending at auction today a bit after midnight on the East Coast and 9:49PM on the West Coast this high grade card has already garnered 35 bids and is at the current auction price of $2,125.00 as of this morning. A PSA 9 sold for close to $16,000 but most PSA 8s have been landing somewhere around $2,500. This could be a good deal for the right collector. So if you are in the market for this card or just want to watch the fireworks as bidding takes off near the end of the auction, use this link to watch or bid. 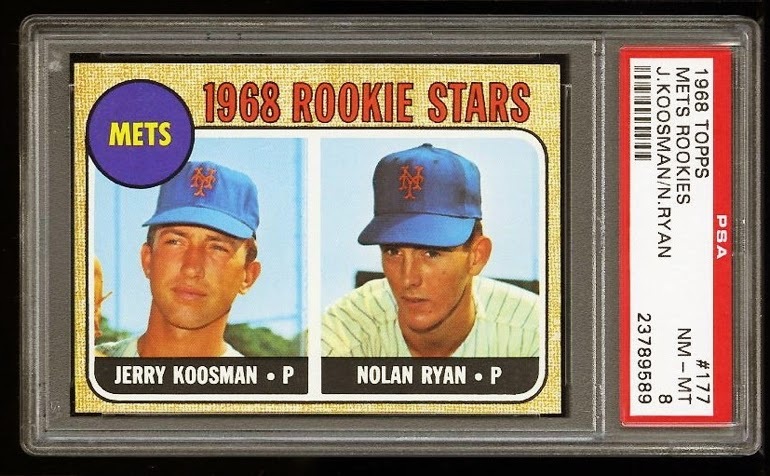 If you would like to find a 1968 Topps Koosman Ryan card more in you price range, there are a wide variety with more down to earth prices that can be found using this link. Some good ones can be found well below $500 and if you are will to sacrifice some quality, sub $200 is possible. 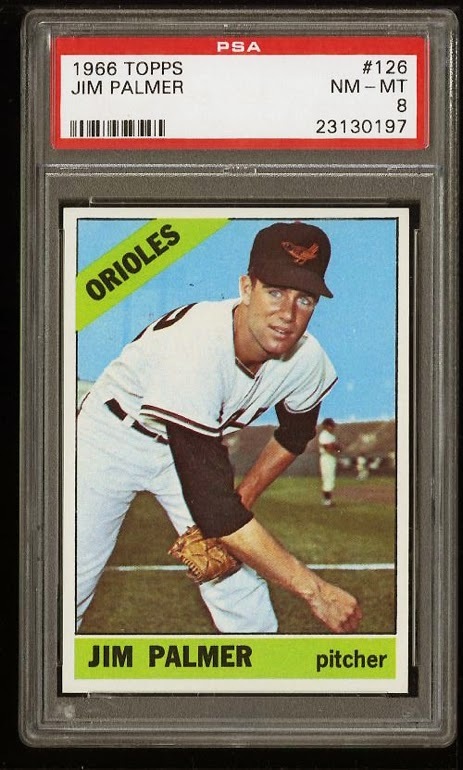 While we are on the subject of rookie cards, how about this PSA 8 1966 Topps Jim Palmer Rookie Card. This one looks great and is hovering at $300 with an end time of 8:11PM West Coast time. This card should not move too much more, so if this seems within you budget, this might be one that can be won with a late bid close to the price. WE would expect this card to land somewhere just south of $350. To try to take this one home, use this link to get to the auction. Just looking for Palmer's rookie card but $300 is too much? $50 is not out of the question. For one thats a little "gently used" you may even be able to get down to about $15. To see a wide range of options, use this link for the most current listings. Here's a bonus pick, only because I saw it next to the Palmer. It's not mint and it's not a rookie card, but at the current bid price of $41.00 it's probably about half the price it should be. This 1966 Roberto (Bob) Clemente looks fantastic for a card graded a PSA 6. One that was graded a PSA 5 just sold for $69.00. One that is the same grade can be had as a BIN for $80.00. This one has some room to move, but could also wind up being a steal if the price stays close to what it is now. For this auction which ends at 6:23 PM West Coast time, use this link to get in on the action. 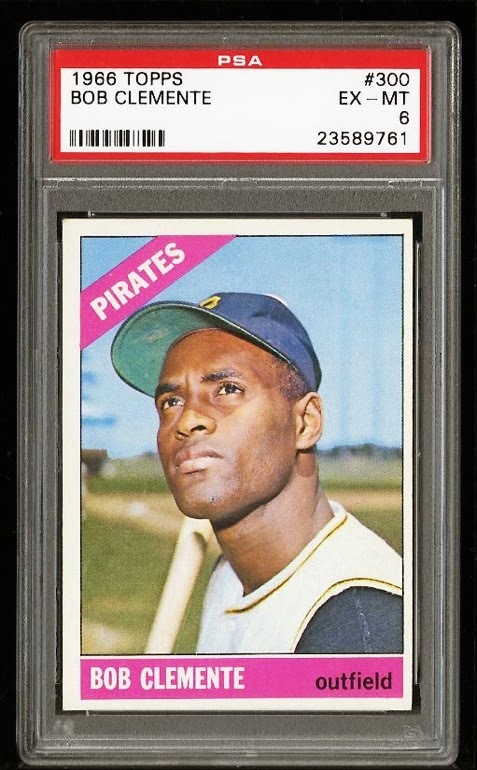 To fins other 1966 Clemente cards, use this link for a wide range of conditions and prices. For a large selection of high graded cards from with prices that are more down to earth, use this link to visit those with auctions ending today on eBay.